Last week we featured Grace Cavalieri's brilliant poem "Safety," about her late husband Kenneth Flynn. "Identification," is, in many ways, the upshot of "Safety's" diminutive ending. In "Safety" we find the poet facing life again as though she were twelve years old, just before she had met her lifelong partner. Because of his loss, she has regressed into a child. But, in "Identification," through a missing bracelet clutching her initials Grace imagines Kenneth speaking, "You, my wife, in silver scroll, are free." Liberated, she has taken back some element of her developing life, a threshold moment she hadn't need face in partnership. It is a testament to Grace's ability as a poet and a person, that she can write with so much wisdom not just as an occupant in the lives of Anna Nicole Smith, Mary Wollstonecraft, and countless others, but as a fastidious reader of her own life. A consummate educator, a "truly generous friend of poetry," we are all grateful for Grace Cavalieri's humility and candor. 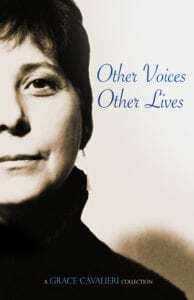 *Grace Cavalieri's legacy book Other Voices, Other Lives is a compendium of her vast body of work, including poetry, prose, drama, and interviews.